When I travel, I like to go beyond the basic tourist destinations. One of the best ways to do this is to set some goals for things to see or do on a trip. On my last road trip, I was traveling with 2 dogs. Finding restaurants with patios and dog parks definitely took me into parts of the cities that I wouldn’t have explored if I just visited standard tourist destinations. A few years ago I took a New England road trip with my friends Cathy and Julie. One of our goals was to see as many covered bridges as we could, but we also wanted to see at least one lighthouse before we headed home. We found our lighthouse in York, Maine. We spent one night in Ogunquit, Maine…which was one of the highlights of the trip for me. Heading out, we decided to see if we could find the Nubble Lighthouse in the town that was directly to the south. Today, I would probably just put the directions for the lighthouse into GPS for a direct route, but for some reason we didn’t do that. We knew roughly where it was and when we got close enough, we could see it periodically through the trees. We just pointed the car in that direction and off we went. The drive was so much more fun than using GPS because we ended up in a residential neighborhood where we kept hitting dead ends. Finding the lighthouse became a quest and I actually have stronger memories about the drive 2 years later than I do about the lighthouse itself. The Nubble Lighthouse was completed in 1879 and was manned by the Lighthouse Service until it was taken over by the U.S. Coasts Guard in 1939. 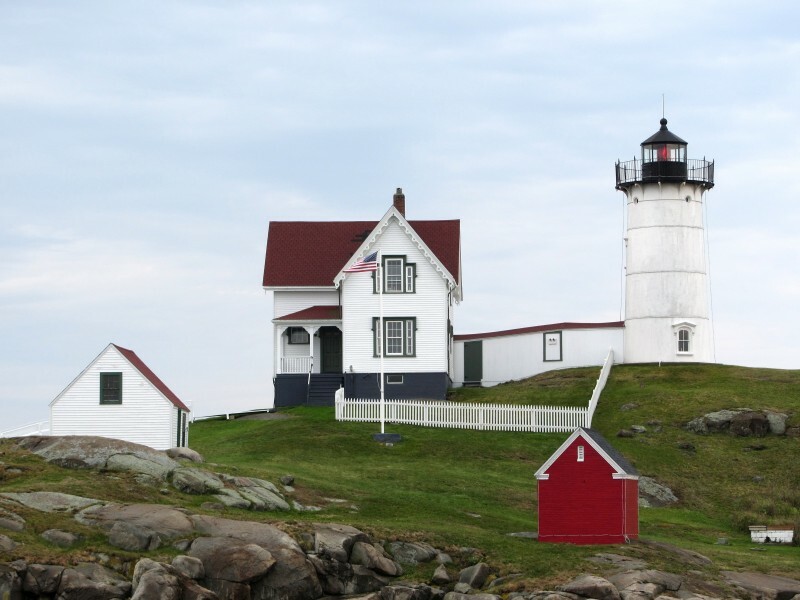 They renamed the Nubble Light the Cape Neddick Lightstation and provided resident caretakers to the lighthouse until a lack of funds resulted in lighthouses across Maine being automated. The Nubble Light was automated in 1987. The town of York was given a lease agreement to maintain the lighthouse in 1987, and in 1997 was appointed the permanent guardian of the Nubble. York now has a Welcome Center and gift shop, and welcomes visitors to take in the views, paint and take pictures. Tours inside the lighthouse are not available. While climbing up into the lighthouse would have been a real treat, just standing on the shore and seeing it in person was enough for us. 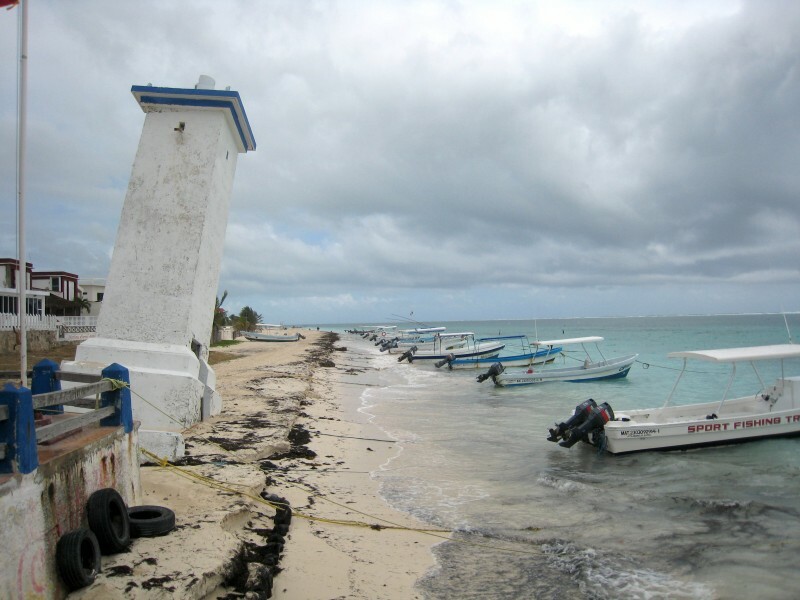 The small village of Puerto Morelos is located between Playa del Carmen and Cancun. Playa del Carmen was our last stop on my first visit to see my brother living in Mahahual, Mexico. Traveling with a rental car really has advantages. Leaving for a mid-day flight, there wasn’t time to really do much that last day in Playa del Carmen, so I looked for something to see on our route to the Cancun airport. 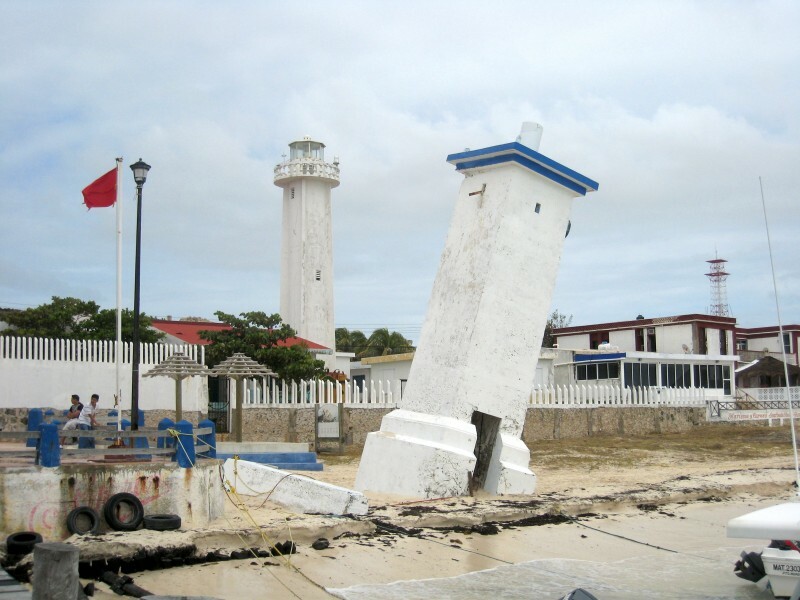 You get to stop at places like Puerto Morelos just to see an ancient leaning lighthouse. The lighthouse is a pre-Hispanic Mayan structure. 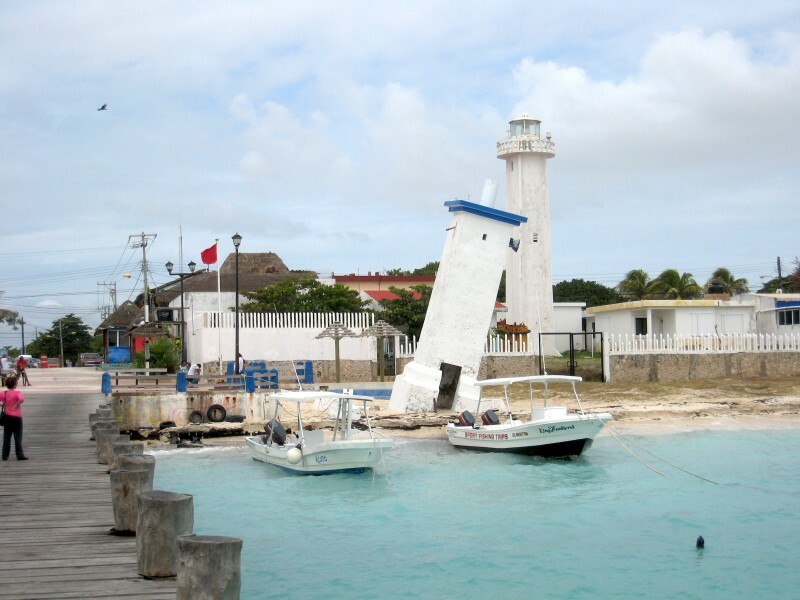 It was inclined by Hurricane Beulah in 1967 and has become the symbol of Puerto Morelos. I’m not really sure when they built the new lighthouse that stands behind the inclined one, but it does create a stark contrast. Have you visited any lighthouses during your travels? I love lighthouses. I don’t love going up in them so much as I’m afraid of heights, but I do love viewing them from the outside. 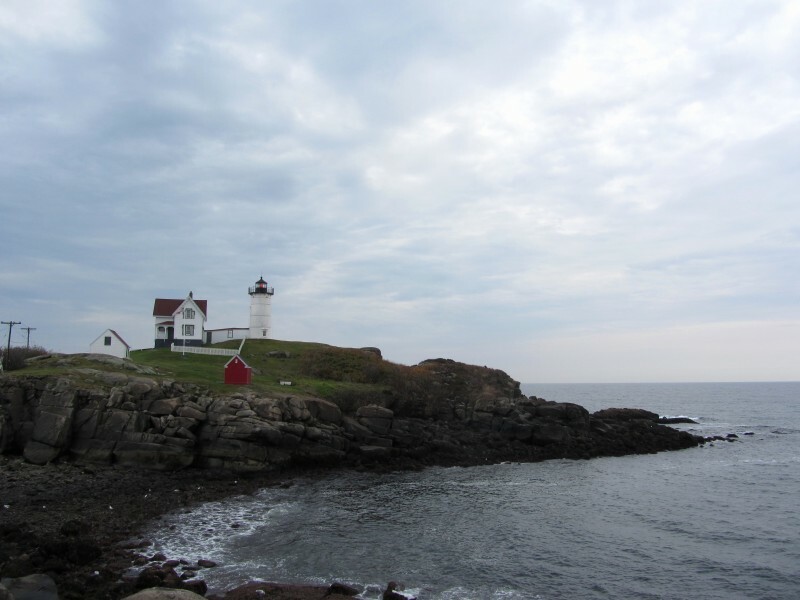 I would love to drive along the New England coast this fall to see the lighthouses.